Glenn Wahl, a member of Cattauraugus-Chautauqua for Clean Water, spoke in Jamestown NY, Oct. 22, 2013. His talk, entitled Fracking 101, offers a comprehensive look at high volume horizontal fracking in western New York state and Pennsylvania. Wahl, a geology instructor at Jamestown Cmty College (Olean), explains the geology of the methane-rich sandstone (Medina) and the deeper Marcellus and Utica shales, thousands of feet below the surface of Western New York and Pennsylvania. proprietary concoctions that not even emergency workers are allowed to know about). It means noxious emissions, noise pollution, and flowback: millions of gallons of flowback from the fracked wells, even more toxic now with heavy metal such as arsenic, barium; a radioactive sludge that further despoils streams, rivers and lakes when it leaches through retaining pits or landfills or is sold to cities and counties for its high salt content, sprayed as 'brine' on New York roads in the winter, and dirt roads in the summer. It means the 'Halliburton Loophole' which exempts the 'fracking industry' from parts of seven major environmental laws. In Pennsylvania, where fracking has taken its toll, the State has been forced to impose a gag order on medical doctors from talking to each other about their patients' illnesses caused by this process. Ultra high volume fracking methods are experimental; they've only been used since 2007. Let's not be guinea pigs. Join the 170 villages towns and cities in New York State that have issued bans or moratoria on ultra-high volume fracking. 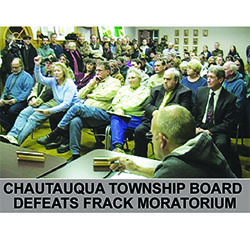 The Town of Chautauqua board considered enacting a one-year moratorium on high volume horizontal fracking, at a public hearing, February 10, 2014. Though the Town board voted 3:1 to reject the moratorium, the two-hour public discussion reveals the nature of the divide between those who support the new industrial scale high volume horizontal multi pad fracking and those opposing HVHF in Chautauqua County. The 96-minute video, filmed and edited by the Mayville-based film group, Snowshoefilms, documents the full statements of each of the 45 speakers. As several local residents noted, over 160 New York towns and villages have enacted moratoria or bans of high volume horizontal fracking, to allow them local control in the event New York State lifts the moratorium on high volume horizontal fracking. Dunkirk is the prime spot in Chautauqua County for potential wet gas, a mile or so below the surface in Utica shale plays. The County Nursing Home sits on 30+ acres that are a likely spot for multi-well fracking pads. The question is, should the County hand over the Home and the land to a private owner -- who will do what he wants with the land, irrespective of the Home; in effect, the people of Chautauqua County -- and especially Dunkirk -- will likely be fracked twice if the home is sold. Please forward this video to friends and colleagues. Dr. Anthony Ingraffea, Feb. 26, 2013, explicates the pros and cons of fracKing Marcellus shale for methane. -- so says Prof Ingraffea, Cornell University shale expert. He notes also that in spite of natural gas's reputation as a clean energy, "the footprint of fracking is greater than that of any other fossil fuel, including coal." Many in Western NY believe that fracking won't present a threat because it doesn't have Pennsylvania's Marcellus shale. However, the area does have Utica shale, rich in methane, though much deeper (7,000 feet or so). Ingraffea's talk (Feb. 26, 2013) was sponsored by the Chautauqua Watershed Conservancy, the SUNY Fredonia Academic Cmty Engagement Center, and the Environmental Justice Ministry of the Unitarian Church. Part Two of Prof Ingraffea's (Feb. 26, 2013) Chautauqua County NY talk, Four Fracking Myths. Western NY, from Buffalo down through Pennsylvania and west into Ohio, has several seams of shale (plays), including Utica, some 7,000 feet deep. Drilling and extraction poses no danger to public drinking water because of the EPA's rigorous enforcement of the Safe Water Drinking Act.